At The Cafe Irreal, when we meet talented writers who know what we mean by irrealism and are inclined to write irreal stories, we tend to publish their fiction as often as we can get it. In fact, most of the writers whose work has been featured in Our Year of Reading at the Irreal Cafe have been published in The Cafe Irreal on a number of occasions. 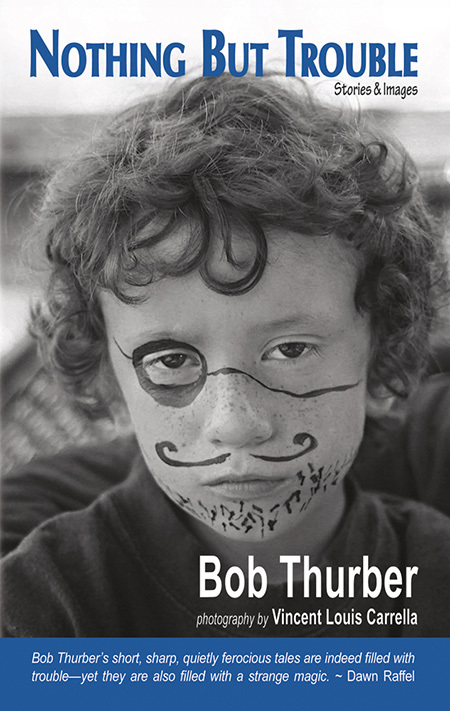 So it’s a tribute to Bob Thurber – an “old, unschooled writer,” as he unfailingly describes himself – that though he is probably best known for his realistic stories, his irreal fiction has appeared on our site more often than anyone else’s (in no fewer than twelve issues). The cover of his 2014 story collection, Nothing But Trouble, features a photograph by Vincent Louis Carrella, whose powerful images add depth and flavor to this volume. Often, they don’t so much illustrate the stories as amplify them, with their steady gaze into a world that is both familiar and challenging. The cover photo is whimsical but also a little disturbing, and it features an impish-looking boy with a moustache, beard, and eyepatch drawn onto his face. As you look at the cover photo you wonder how this image could fit the description of art given by Christine Brooks Cote (founder of the volume’s publisher, Shanti Arts) when she says that art “often brings with it a powerful sense of stillness and focus.” Yet the cover image does give us a chance to think about the title – Nothing But Trouble – before we dip into the stories, and as we read on, Carrella’s photos continue to give us resting points, places where we can stop and mull over Thurber’s sometimes heart-breaking stories before we continue reading. They also gave me a chance to think about the ways this “old, unschooled” writer creates his own version of the irreal. As I said earlier, we published Bob Thurber’s work in The Cafe Irreal twelve times, and six of the stories we published are included in this collection. “The Cat Who Waved,” which appeared in Issue #5 (in 2001), is here accompanied by a photograph of a barn owl that looks as though it might be dancing. Though we agree with Kafka that nonrealistic stories shouldn’t have realistic illustrations, in this case the irreal nature of the story is actually enhanced by a photo of a dancing owl. “The Cat Who Waved” is a deceptively simple piece about a man who spends the night with a girlfriend, wakes in the dark, and thinks he sees, out on the balcony of the woman’s ninth-floor apartment, two cats. He tells us he’s had dreams like this; he says he’s seen illusions brought on by trying to see through thick thermal glass or having drunk too much alcohol; he says he thinks the shapes might be pigeons or might be owls (in this way the image of the dancing owl relates to the story but doesn’t exactly illustrate it). The narrator also admits to having problems with his eyes, and he gets out of bed to try to see these shapes for what they are. Going over to the balcony door he says, “You tap the glass, trying to get them to turn, these two dark shapes. Owls can turn their heads 180 degrees. They have to. Their eyes are so large they have no room left for eye muscles. Barely room for brains,” but then he becomes more certain than ever that they are cats and that one of them waved at him. The rest of the story involves the narrator’s attempt to explain – to the woman and to himself – what he has seen. The story undermines our expectations subtly, and the photo of the owl helps it to do that. Several years later, in Issue #34, we published “You Don’t Belong Here,” which also appears in this volume. As the story begins, the narrator tells us that he has been invited to a surprise birthday party for a friend. He says he has few friends. He says he really hates parties. He says he sometimes does go to them, but the problem is that he often runs into his doppelganger. The story’s title becomes clear when the narrator describes an incident at a wake where he encounters his doppelganger in the restroom and they simultaneously call each other “my evil twin.” Then the narrator says, “After a long accessing stare, we both said, in the same tired voice, ‘You don’t belong here. You should do yourself a favor and leave. '” He describes other events at which he and his doppelganger have both shown up. We begin to wonder if this is some sort of psychological disorder, if the narrator is hallucinating, and we are told that this presence of the other, the “evil twin,” the doppelganger leads to confusion for both men and sometimes neither is sure whose life is which. Part of the pleasure of reading Thurber is the deftness with which these events are handled. The dialog is spot on. The incidents are believably told. Yet the oddness of the outcome, which blends so smoothly into the story as a whole, is what makes it irreal. The story springs into a different configuration, a different perspective, like those optical illusions where you see the head of an old woman looking one way until someone suggests that they see a young girl looking in another direction. This shifting perspective is the key to the irreality of this piece. “A Woman on the Bus,” which we published in Issue #38, follows a somewhat different trajectory. The viewpoint character often sees a woman on a bus, but each time she is so differently described, we imagine that this can’t possibly be the same woman. She is dressed in varying costumes, she is pregnant perhaps by the bus driver, she is not pregnant, she is in pain, she is “quite composed,” she looks like she is dying, she looks “lovelier, more beautiful than ever,” and she even has some hard-to-define relationship with the narrator. It’s Thurber’s choice of detail that keeps us engaged, as in “The next time he saw her she wore plaid everything, except for her Buster Brown shoes. She was telling a man with a brown cap that she had released her equity, consolidated her assets, become bullish on America.” The ongoing litany of these sightings has a dreamlike quality that undermines our expectations yet again. In “Crackers,” which appears in this collection and was in Issue #40 of The Cafe Irreal, the setting is old fashioned and evocative. The narrator lives in a rooming house with a main door at street level. People wedge the door open with a brick. The narrator lives on the third floor and says he was never bothered by people who came in off the street, attracted by that welcoming open door, “but one hot August night, while I was eating stale crackers and reading at two A.M. with my own door open, I was visited by a strange white-haired man in a rumpled sports jacket who claimed that he was from the future, my future, that he was in fact me.” This sounds like vintage Twilight Zone, but in such stories isn’t the visitor from the future, who is the future version of the narrator, supposed to give him warnings that make life easier or more livable or at least tell him what to expect? Not here. Thurber undermines our expectations of what we want to get from a Twilight-Zone-style tale and gives us something a little more philosophical that includes some advice for writers. The photo that accompanies this story about a photo shows the rotary dial and coin slots of a very old pay phone, but that’s OK because the irreal nature of this story comes not from the Twilight-Zone wonderment of how someone could be calling on a pay phone after all these years and get her ex-husband, but the emphasis that the story isn’t really about weirdness but about that combination of poignancy and cynicism that Thurber evokes so effectively and which in this case undermines our Twilight-Zone expectations. There are a few other non-realistic offerings in this volume, but most of the rest of the stories in Nothing But Trouble are what we might call naturalistic or realistic stories. Thurber turns his steady and unflinching gaze on failed or failing relationships between parent and child or between domestic partners, and again and again he views poignant situations with a cynical and distanced eye. In “My Daily Bread” a father tells his son he’s just “nailed” the babysitter that the son once had a crush on. In “Portrait of a Virtuous Woman” a wife threatens to cut her hair short in order to keep her physically disabled husband in line. In “Cryptogram” all the members of a family try to help a dying man communicate, but as the title suggests this isn’t entirely successful. In Nothing But Trouble the stories and the photos give us that “powerful sense of stillness and focus” Christine Brooks Cote describes because they help us see what we might easily have missed – either because it was too painful to look at or because we didn’t even know it was there. You can buy Nothing but Trouble at Shanti Arts or at Amazon. For more of Vincent Carrella’s work, go to http://www.thelighthouse.photography/.